The skeleton forms the basis of a model. Technically, it is built from a hierarchy of “coordinate systems”: Starting at the root, each coordinate system is defined in the coordinate system of its parent. Model artists use these coordinate systems to fix the points (weights and vertices) that eventually form the meshes of the model. If we compare the skeleton of a model to the skeleton of the human body, the “coordinate systems” closely correspond to “joints”: the coordinate origin is in the center of the joint, and the coordinate axes correspond to the bones that extend from the joint. In this analogy, a “bone” is the line segment between a coordinate origin and the coordinate origin of its parent system. 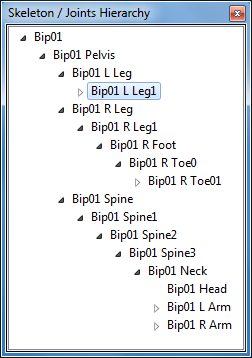 The Skeleton / Joints Hierarchy pane shows all the joints in the skeleton, hierarchically arranged. Items in the hierarchy tree can be expanded or collapsed with the nearby symbols. A single click on a joint selects it, a double click opens the Joint Inspector pane as well. Pressing the F2 key or a single-click on an already selected joint allows you to rename the joint in place. Expand all expands all items in the joints hierarchy tree. The Joint Inspector pane shows the details of the currently selected joint. The General section shows the name of the joint (it's another option to rename it), and the index number of the parent joint. The parent index number is a technical detail that cannot be changed. You need it only if you edit the model file in a text editor or work with the Cafu model C++ data structures. This section shows the position, orientation and scale of the joint (i.e., the coordinate system). Note that the details presented here only affect the bind pose of the model. 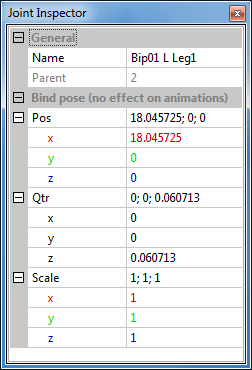 The bind pose is the default pose of the model: it is used whenever no animation sequences are loaded or none are actively used. That is, the Joint Inspector is great for manipulating the individual bones of static models. It is however useless for animated models, because technically, each animation sequence brings its own set of (animated) joints that cannot be manipulated individually. If you want to do that, refer to Transforms: translate, rotate and scale instead. Pos defines the position of the coordinate origin relative to the parent system. Qtr defines the first three values of the quaternion that describes the orientation of the coordinate system. You should not attempt to manipulate these values if you don't know what quaternions are and why it only shows three instead of four values. Scale expresses the scale (or relative length) of the three coordinate axes.